The 8 collegians from Ohio Wesleyan College in Ohio left Saturday morning and an equal number arrived Sunday morning from Canisius College in Buffalo, NY. Both groups are here for their Spring Break and we do indeed love having them. On Saturday we welcomed 25 women for a one-day retreat: "Women in Transition." The weather cooperated nicely and although spring is still a couple weeks from breaking out in this lake plain of ours, the bright early spring sun did make it a clear day for such a gathering. 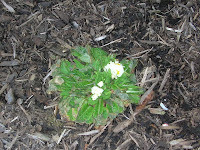 Look what I found in the corner of the inner courtyard garden this weekend: ah, ha---it is indeed coming! 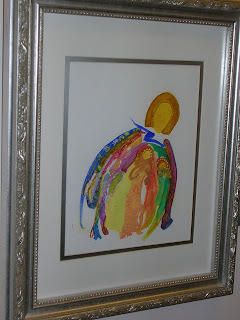 From the March Art Show here's a delicate work by Rita Pruchniewski, OSB. I believe Rita is 83.